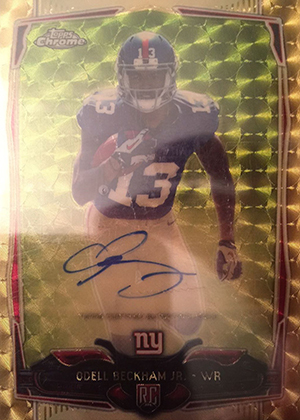 The 2014 Topps Chrome Odell Beckham Jr. Superfractor Autograph has been pulled. Not surprisingly, it has found its way on to eBay. The card is listed with a hefty $12,499.99 Buy It Now, although the seller is accepting offers as well. To this point, this certainly ranks as one of the top cards of the 2014 football season, if not the best. Thanks in large part to "The Catch," Beckham has emerged as the sport's hottest rookie right now and 2014 Topps Chrome Football is one of the key sets of the year. On the Blowout Cards forums, the seller says that he received an offer of $5,000 but declined. By comparison, the unsigned 2014 Topps Chrome Odell Beck Jr. Superfractor sold on eBay on December 12 for $1,750. The Johnny Manziel Superfractor Autograph went for $4,500 on December 22. It was inscribed "Money Manziel" and graded BGS 9.5. The Blake Bortles Superfractor Autograph, which came in as a pristine BGS 10, reached $1,000 on December 17. The listing for the Beckham Superfractor Autograph closes on January 4. UPDATE (12/29/14): The card sold on Sunday, December 28 for $5,000. 2018 Panini Prestige Extra Points Blue #56 Odell Beckham Jr New York Giants Jr.
2016 Panini Prestige Xtra Points Gold #130 Odell Beckham Jr New York Giants Jr.